Redeem your first flight to exotic locations! This one in Shah Alam is really big and the food you posted is much different and interesting from others I have been to. 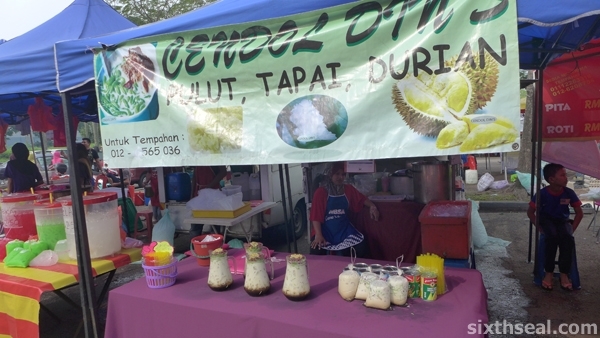 I have not seen the Durian Crepe, Itik, Fresh dates and Chendol Durian flavour anywhere! 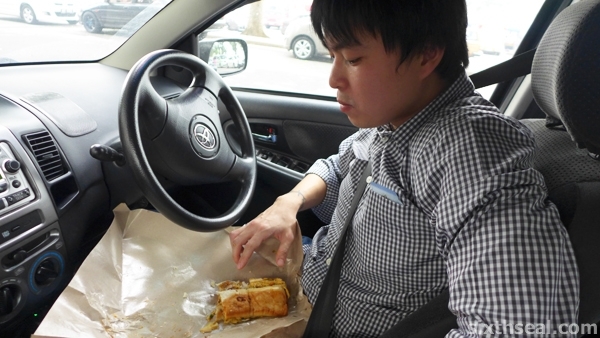 I was buying yummy Ramadhan Food home for 3-4 times and just stopped because I was over buying them due to my greed! I could not finish them at all. 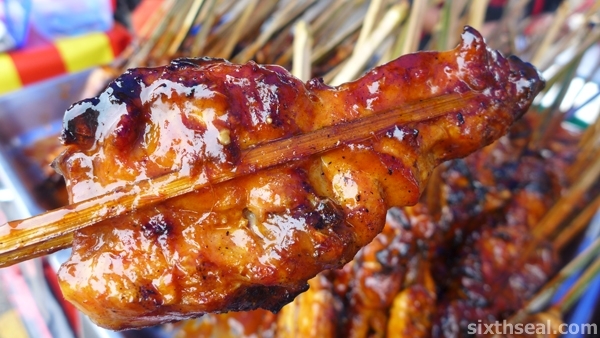 Talking about food hygiene, this is important as I have heard of other food poisonings too. I heard about some on a radio channel while driving too. 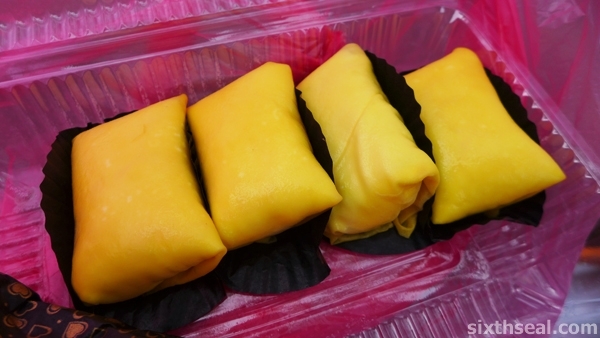 The durian crepe is similar to the ones sold at some char chang teng, but better coz it doesn’t have as much cream. I know what you mean! I spent a lot coz there’s so much things I want to eat too and it all adds up! They sell those in certain hypermarkets too but those are mostly from India. These are from Tunisia, which I found to be better. 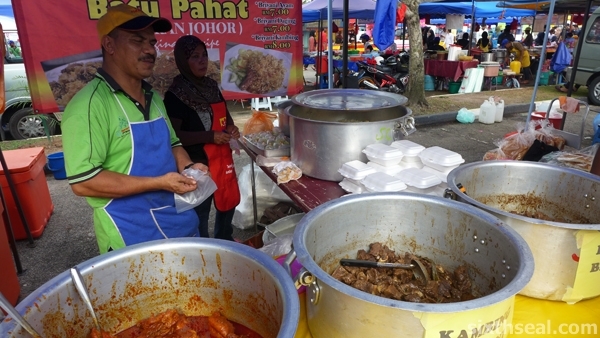 Yeah, you can get food poisoning coz some of the prepared food has been there for ages. We stick to the hot food mostly. I’ve tasted fresh dates before. It tasted rather crispy but seeing that it’s raw, I could handle three at a time. 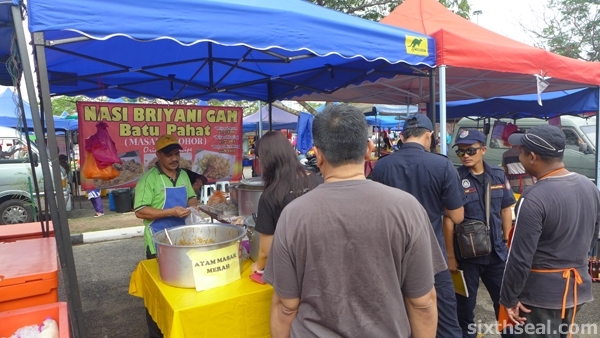 No wonder I saw MPSJ officers patrolling the area while driving past one of the Pasar. 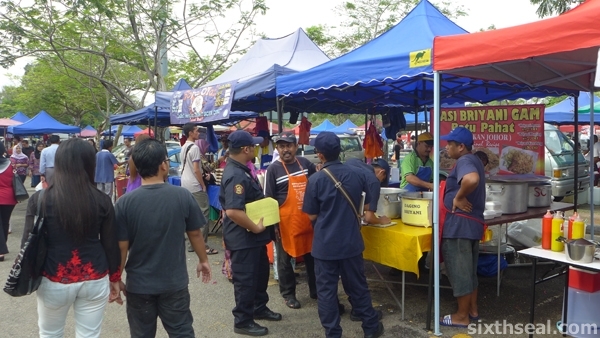 I thought they were only there to man the traffic and buy some food to break fast with. 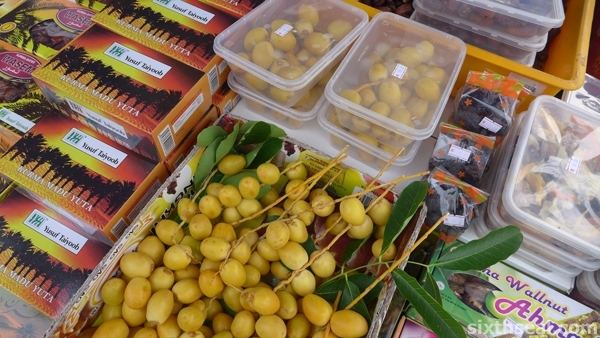 Yeah, fresh dates are awesome, although I can’t eat too much too. 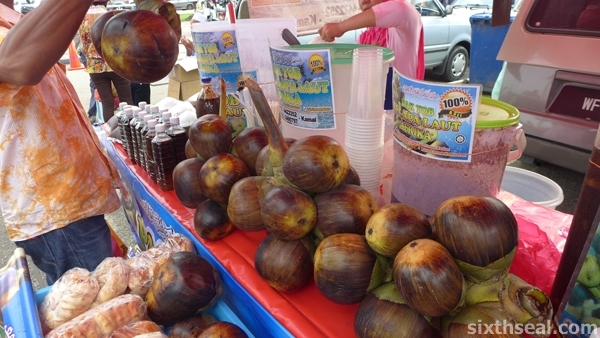 It’s nice coz the texture is different from the dates that comes from a branch. I mean, these comes from a branch too, you just pick it into a box but the dried ones are the ones I love and I can eat *tons* of them. Yup, the licence needs to be visibly shown apparently! 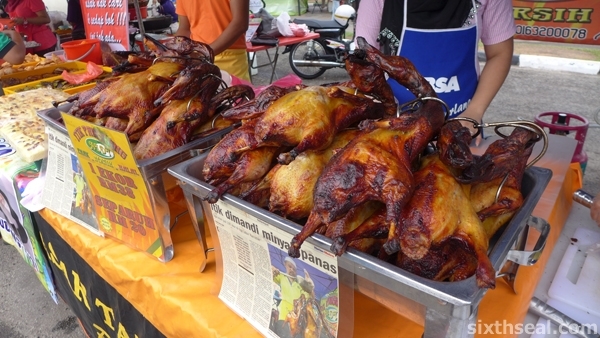 i love ayam percik! 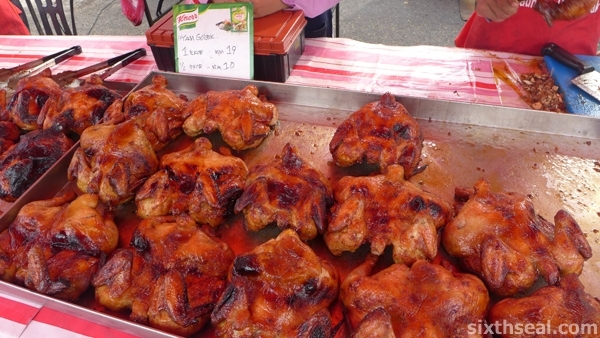 i bought few pieces from the pasar malam but not nice one.. wasn’t well marinated! 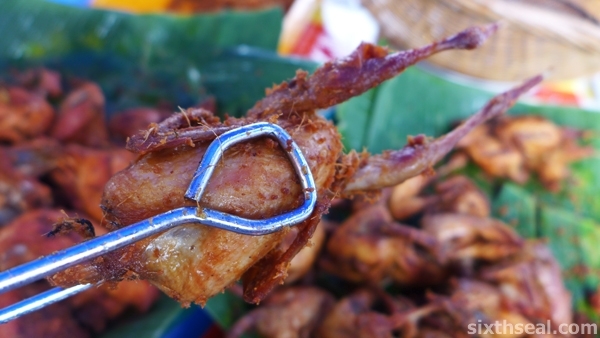 I’m not a huge fan of ayam percik though, that’s the one I only ate a little bit of while my dear finished it so it could be that. It’s cold after standing in the servers for so long while all the other stuff we bought were either still hot, made as we watched, or cold. Aaahhh…. 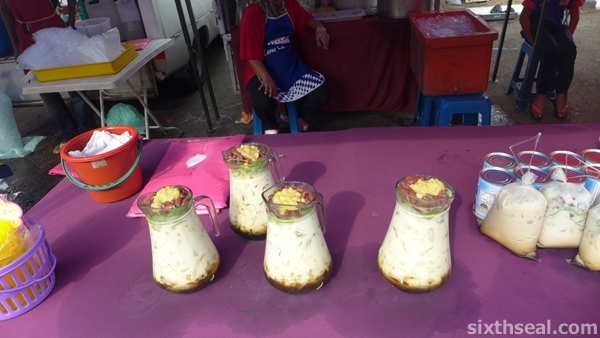 this is one thing I really miss about Malaysia. All the different foods and cuisines. As a kid, I always couldn’t finish the entire thing coz it’s as large as a French loaf. I can now although I wouldn’t be able to eat other things! It has 3 (!!!) oblong burgers inside, they’re very generous with the filling, although it’s double the price of the normal ones with minced meat (which is in the Extravaganza too). 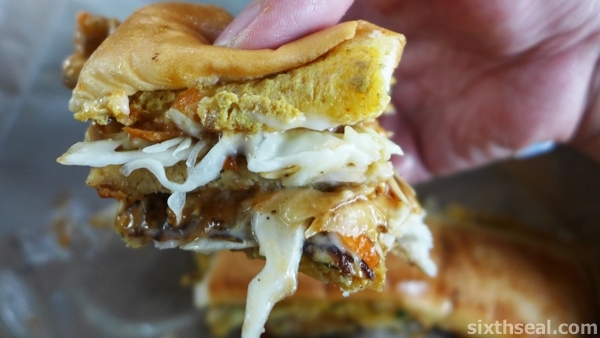 The roti John looks good! Hadn’t had one in years! 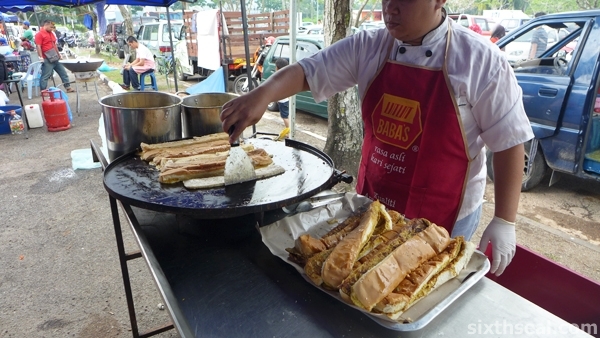 I’ve always thought roti John was a Singaporean invention though, for whatever reason, used to read about that as a kid. HB, sorry to read of Ying taken ill from the food. I too worry of street food if not eaten right away. Had some friends also food poison from street food. Fresh made and eaten right away but they took back to hotel to eat that what happened. Yeah, some of the food that has been standing there a while can be a bit dodgy, which is why we stuck to mostly hot food, food prepared in front of us, and cold stuff. One of your best posts in awhile, HB! I really enjoyed it! All that food is making me crazy! I’m sorry your lady got ill. I hope she’s feeling better. You mentioned the vendor with the English accent. How much English is really spoken there? We’re expats and move around a bit. 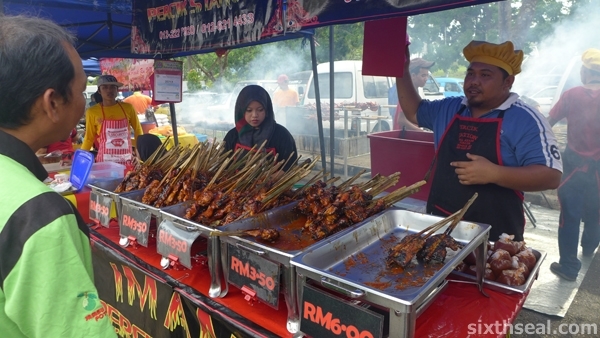 I’ve always wondered how we would really get along in Malaysia. Most people can understand and speak English to varying degrees. Smaller towns can be a bit of a problem though…and by that I mean real rural areas. I think you’ll get along fine though. Thanks for the concern Mari, she’s all good now! Come on over, cities like KL are quite cosmopolitan (not to the extent of Melbourne or Singapore) but English can be understood by most people. 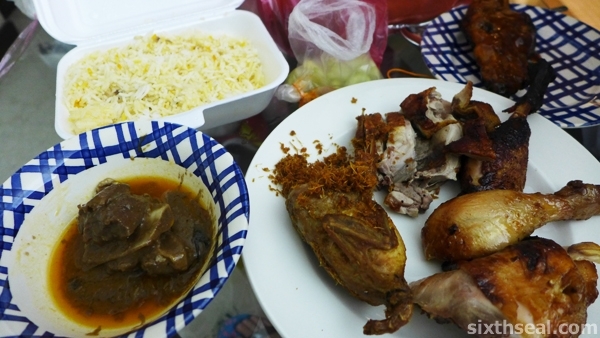 The ‘itik mandi’ and ‘ayam golek’ is by far the best local cuisine I have enjoyed. 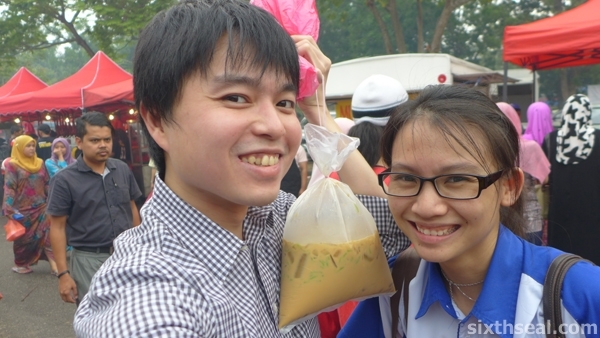 Even threw the last piece of chicken breast into our noodle yesterday..Also the cendol and crepe were a good buy! I ate the ones we couldn’t finish (except the last piece) the next day and the last piece lasted till yesterday! Haha! 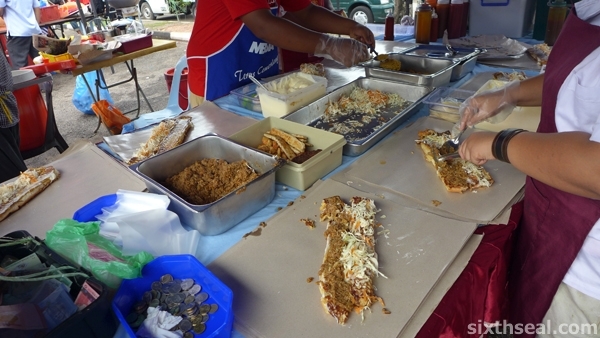 Oooo…I love those durian crepes. RM10 for 6? Can’t remember how much they cost at the malls – probably cheaper here. 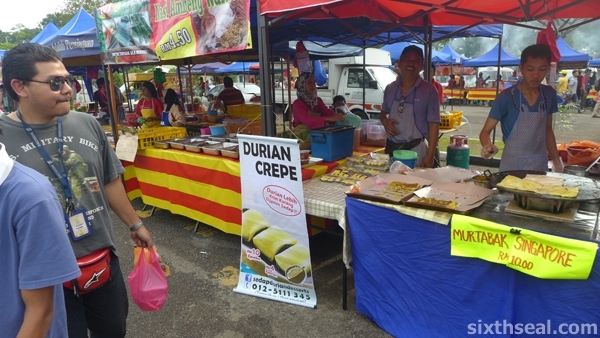 The total 6 pillows of durian crepes combined is smaller than a Shanghai 10 durian crepe (which is less than RM 10). However, despite being more expensive, it tastes good though. The tiny coin sized durian pillows have more durian filling inside instead of the ones they sell at malls and char chang tengs, which is mostly cream. 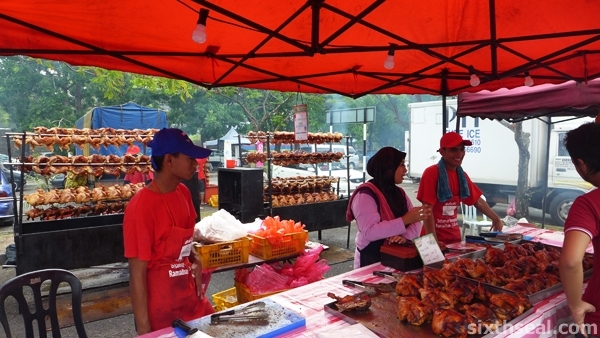 I looked forward and enjoyed visiting the pasar ramadhan! Lots of food under 1 roof. hehe…. 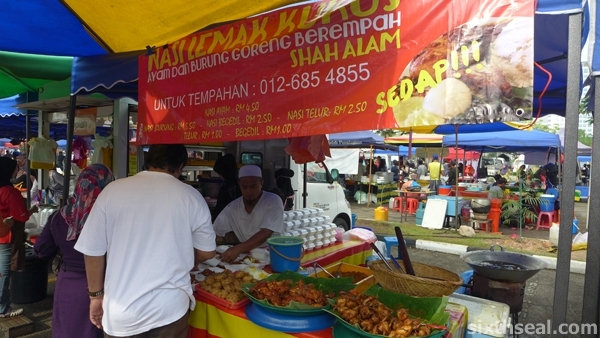 (tam jiak person is liddat)..This Pasar Ramadan Shah Alam, the food prices looks okay. 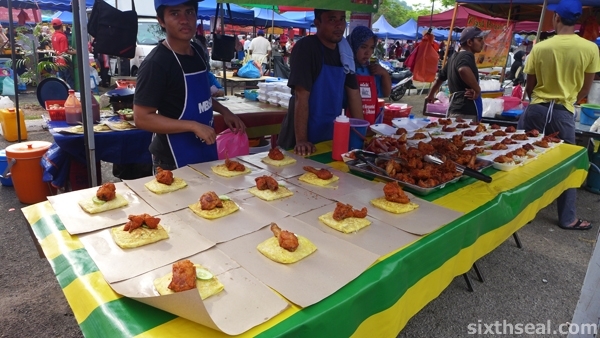 The ayam golek..Seremban selling at RM20/chicken. More expensive summore. Wow! Seremban prices are more expensive than Shah Alam? 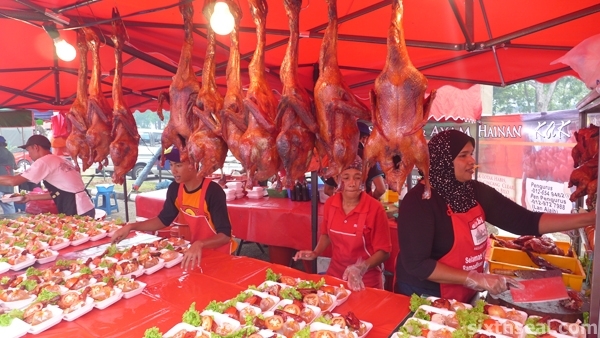 I’ve also seen RM 28 chickens but never bought the overpriced ones. 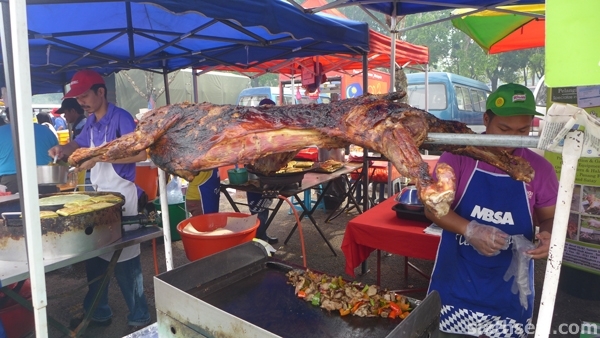 That’s the most expensive I’ve seen in Pasar Ramadan Stadium Shah Alam but most are RM 20 and below. I actually worked in KL twice – even had a category for it since I started my blog almost 11 years ago – once when I graduated from university in Melbourne 2003 and again in 2008. The first time I got a way better offer with stock options at a start-up in Kuching so I went back in 2004. 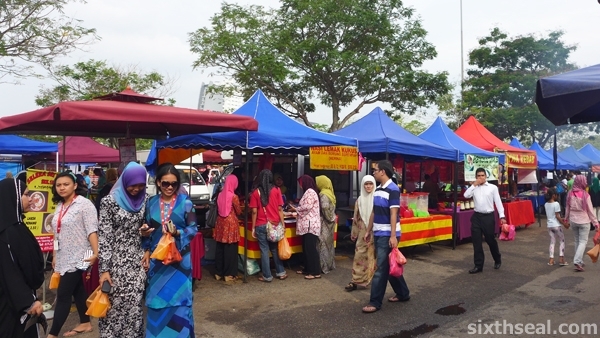 I always liked the pasar ramadan here. 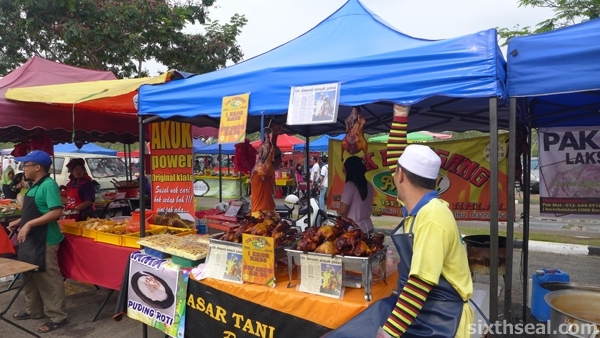 I try not to go to pasar ramadan too much… the food are usually tempting and I always buy more than I can eat! We went and saw so much delicious food that we spent quite a lot and realized that it was more than we’ll have spent if we had gone out for a nice dinner. Haha! All the little things that you buy will add up to the total cost.